Cork-extractors have been made with prongs which in use are inserted next the inner sides of the neck of the bottle on opposite sides of the cork by pressure to embrace the latter. 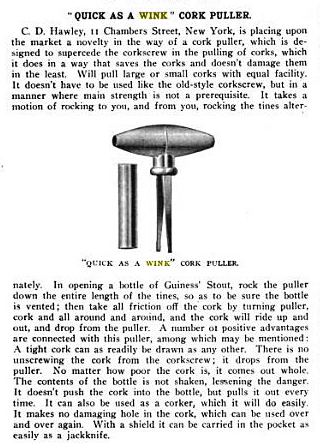 It is to this class of cork-extractors that my present invention relates. 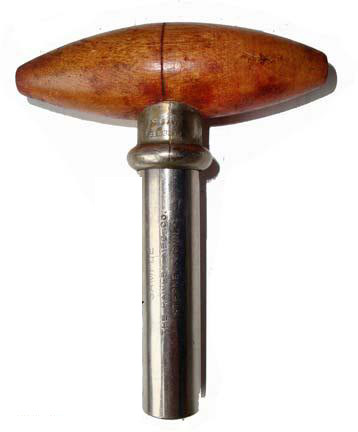 In this type of cork-extractors heretofore various devices have been employed to adapt the prongs to operate on corkscrews of different diameters, involving more or less complication, consequent costliness of manufacture, and liability to derangement or breakage, and in all the flat external plane of surfaces of the blades or prongs have been arranged at right angles to the longitudinal axis or land of the handle, so that it is inconvenient to adjust the prongs astride the cork. The objects of my present invention are to overcome these several disadvantages, to cheapen the cost of manufacture, and to provide a cork extractor of the type described that will be durable and that may expeditiously used, all of which I accomplish by means of the devices, combinations, and arrangement of parts and the forms of their construction hereinafter fully described and claimed, where in it will be found that my invention consists chiefly in first arranging the flat plane sides of the tapering prongs in planes parallel to the axis of the handle; second, in improved means of securing the prongs to the handle and in certain other particulars. Converse had sixteen patents, and the fact that he was a patent attorney is an interesting sidenote. Until, of course, you come to find out that our man Maschil was actually the patent attorney for Lucien Mumford--whose pronged cork extractor (Patent No. 474,480, issued May 10, 1892) would have been one, "...involving more...complication, consequent costliness of manufacture, and liability to derangement or breakage..." that Converse describes in his 1899 patent. Converse's other patents include: Improvement in Nail Extractors, Improvement in Tools for Drawing Spikes, Five different Nail Extractor patents, Pivoted Tool, Lateral Adjuster for Planes, Sliding Ram for Tools, Chaplin’s Improved Patented Plane, Involute Wrench, Plane, and also relevant to the cork-extractor, a May 29, 1899 patent (625,491) for a Rivet. The Rivet patent comes into play on an unusual variation of the Converse cork-extractor. A few examples have turned up with a a bottle opener handle, prongs, and standard Converse sheath. And, it is marked PATENT APPLIED FOR on the prongs. Converse's May 29, 1899 patent explains, "My present invention relates more especially to self -setting hardened-steel or other hard-metal rivets, pins, and studs to be fixed in ductile, wrought, or malleable cast metal…It is frequently desirable that the head ends of rivets, pins, or studs or analogous members should not project beyond the external surfaces of the parts attached and that the same be of hardened metal." 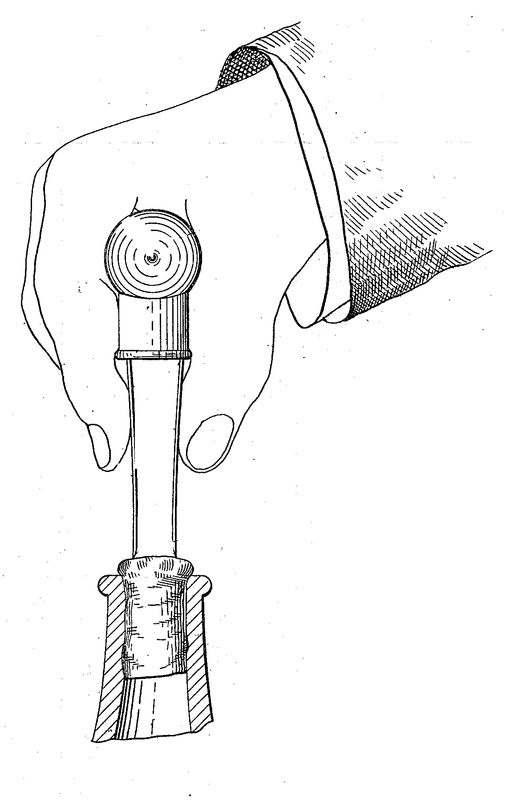 While no prongs are shown in the patent drawing, given the same sheath, and similar prongs to the more common version of the Converse, it would seem that this indeed is a Converse cork-extractor, albeit an unusual variant under a combination of 1899 patents; 624,457 and 625,491. LEHMANN'S RYE – ARTHUR LEHMANN & CO. – PEORIA, ILL. 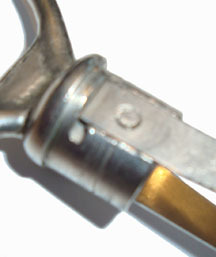 Unlike the above, that features advertising on sheath, this unusual example carries advertising across the handle. Another interesting Converse, is a "Sample," from the Hawley Manufacturing Company of Stepney Connecticut. Hawley's "SAMPLE." does lead to some interesting information, as Hawley Mfg. was indeed one of the manufacturers of the Converse patent, and they definitely were marketing their cork puller. 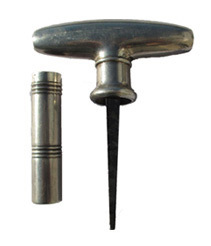 "AGENTS, Canvassers, Street men… We manufacture a Novelty Cork Puller. It's the slickest thing out. Men and women buy instantly, write for particulars. Hawley Mfg. Co., 631 Main Street, Stepney, Conn"
And, in 1905 C.D. 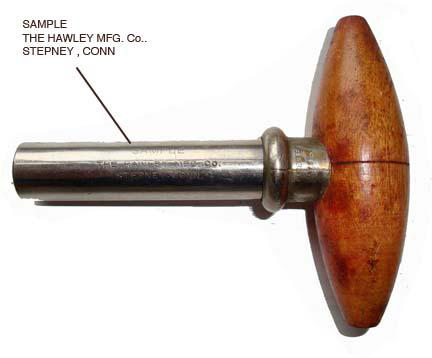 Hawley got some press from the publication Hardware, Devoted to the American Hardware Trade, for their Quick as a Wink Cork Puller. How many variations of Converse advertising are out there? I am guessing there are more than the few that I have listed above. And, I would like to build a database of the various advertisments out there. Are there other "samples" and other manufacturers? Please feel free to send pictures of the Converses with advertising in your collections for inclusion here (or you simply mail the actually cork extractor to me, I will make room in the collection! ).